Master of Commerce or M. Com is a postgraduate Master Degree which specialize in commerce, accounting, management and economics related subjects. just like the Bachelor of Commerce. The Master of Commerce usually comprise of 2 years of regular study with a regular attendance (not less than 75%). The program is generally focused on different disciplines like accounting, actuarial science, business management, corporate governance, human resource management, economics, statistics, finance, marketing or supply chain management. There are many more career options present for you in the field of finance as well. Here is the list of finance course that you can pursue for a better career. This courses is especially meant for college students who are presently at the entry level and want to expand their knowledge and career. In M. Com, students are given a choice to major in any of the given specializations. Students who wants to go for further studies or courses like in research or doctorate level can get a bonus with this course. Many Companies and organizations in today’s life are looking for specialized and expert marketers to get higher profit in a smarter way. Here are some Courses in marketing that you can pursue to start a career in marketing. The higher academic degree is awarded for research work of the candidate, demonstrating original contributions of "special excellence" in some branch of commerce. The research academic degree is equal to a Doctor of Philosophy. Reportedly, at some universities the degree-title honored will be a function of the candidate’s background: for example, in operations research. The Doctorate of Philosophy can be done in many majors like Financial Studies, Commerce, Statistics etc. International Financial Reporting Standards (IFRS) are a set of international accounting standards, transactions, financial statements and Financial Statements. IFRS are issued by the International Accounting Standards Board, and they specify exactly how accountants must maintain and report their accounts. IFRS were established in order to have a common accounting language, so business and accounts can be understood across borders. International Financial Reporting Standards is for Finance professionals who need to acquire more a detailed understanding of IFRS. DipIFR is a fast and efficient solution that will develop the current knowledge of this field. Conversion of Financial Statements prepared on the basis of Indian GAAP to IFRS based financial statements. M.com graduates are also eligible for all the certificate courses in Banking, Stock Market, Derivatives, Income Tax etc. This will also give them a specialized skill which will be of greater advantage as compared to other graduates. Chartered Financial Analyst Program is offered internationally by the American based CFA Institute to candidate having knowledge about investment and finance. A candidate who successfully completes the program and requirement of the CFA Institute is awarded the ‘CFA Charter’. It takes an average of 4 years for a candidate to complete and earn their CFA Charter. The program covers a broad range of topics which includes investment management, financial analysis, stocks, bonds and derivatives and other financial attributes. A Company Secretary is a senior position professional in a private sector company and public sector organization. A Company Secretary is responsible for efficient running of the company’s administration in regard with the compliance with legal and regulatory requirement and for ensuring the decisions made my board of directors are implemented. Student has to go through 15 months of practical training. ICSI Executive program can be pursued after foundation course. Professional program can be pursued after successful completion of the Executive course. After completion of professional course and 15 months training student is joined as Associate Member of the ICSI and called as Associate company secretary (ACS). M. Phil (Master of Philosophy) is an advanced post graduate research degree. Master of Philosophy is thesis based only and is considered as the second master’s degree. Very few Universities offer M. Phil in India and it is a 2-year long program. 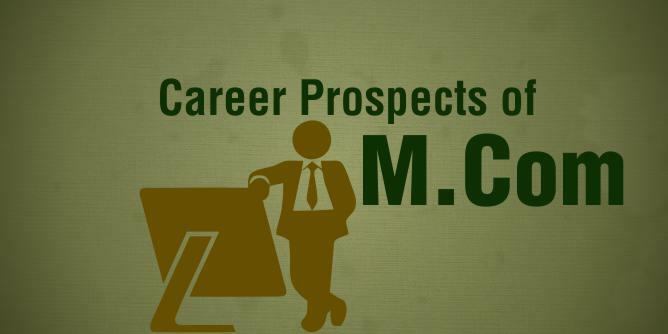 M. Com presents a lot of career opportunities to the candidates. Banks and Financial organizations/companies are the major employers of these candidates. In India, Government organizations are the major employers of M.Com Graduates. Central Government companies offer numerous opportunities with basic pay at the entry level is INR 20,000/- to INR 30,000/- per month. Employees do get grade promotions while in the job and hence see the hike in the salary. In addition to this, working in a government organization comes with a lot of perks like gratuity funds, travel allowances and etc. To secure a government job, a candidate need to pass few test conducted by government such as UPSC, SSC, state PSC etc. Private sector has always maintained a status of paying more than the Government sector. Same is the case here; a master degree holder in private sector company gets paid around INR 30,000/- to 40,000/- per month. Candidates with experience and proficiency, can easily earn up to 6 figure income. If you are looking for a career to improve your salary package then there are many courses available for obtaining good salary. In today’s competitive world, if you are not satisfied with the career or course you pursued there are many short term – high value – low investment courses available in the market. If you have any questions about the above listed careers or any other career, do mention it in the comments section below. Best M.com College in Lucknow. Best B.com College in Lucknow.